What Does Fort McMurray Think of the Housing Market? I posted a fun little poll on Facebook recently. What do YOU think the future of the Fort McMurray housing market looks like? Since the start of the Fort McMurray real estate correction (late 2014), we’ve kept an eye on the mood around town. As we surmised in recent blog posts, ultimately the real estate market is underpinned by economic fundamentals, but it’s affected on a monthly, weekly or even daily basis by confidence. As you’ll see in the examples below, these two are related to each other, but not perfectly so. What do I mean by this? I’ll give some examples2. Even with a sharp downturn in oil prices in 2008-2009, the city’s population has grown more than 70 per cent since the year 2000. 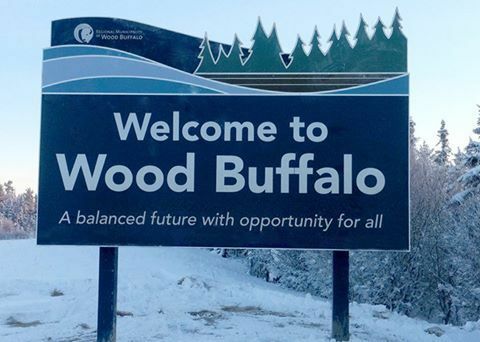 Recent census figures set Fort McMurray’s population at about 73,000, with another 39,000 people living in work camps and surrounding communities. “Certainly, when we had a setback in mid-2008 it was the best time we had as a municipality to get our plans articulated and put into place,” says Blake, who has served as mayor since 2004. The sad reality (that the fundamentals suggested far worse) had not yet formed part of the public consciousness. In fact, the previous correction (2008/2009) had been short-lived, and so that event dominated memory and expectations. Looking back, it is surprising that there weren’t more listings in those early days. It’s really hard to show what I mean by just using charts, so I’ll also try to explain what we feel as REALTORS® in such an important oil town. 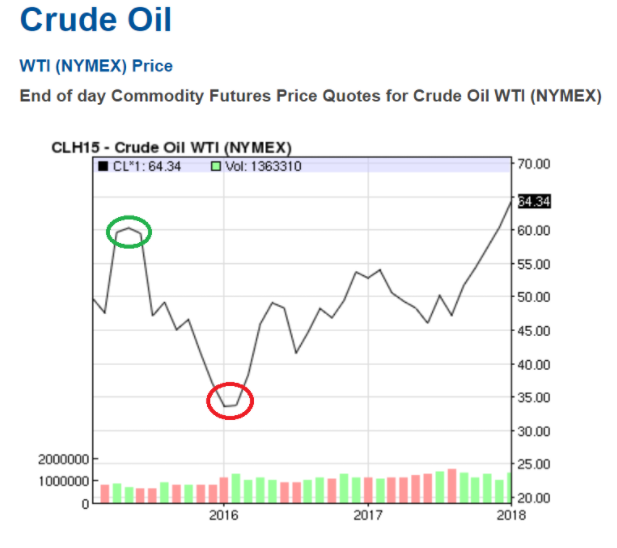 While the WTI oil price over the last three years has been under about $60 a barrel, as you can see from the following chart, there have been ups and downs as the market has ebbed and flowed. For example, check out the green circle on the chart: Oil took its time to really find its bottom. There was hope, even in the oil market for parts of 2015. This arguably contributed to the hope in example 1 (above). As you can see, in the 4 months before the fire, the town’s real estate market was paralyzed. 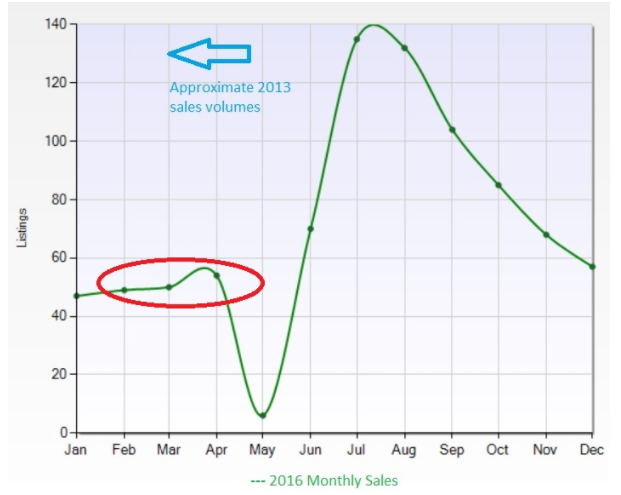 Real estate sales volumes were now down 50-80% on a monthly basis vis-a-vis a boom year like, for example, 2013. Even The A-Team only sold 13 listings in 2016 in the four months before the wildfire (compared to, for example, 11 pending and sold so far this year [and it’s only the start of February]). Prices were in freefall. It’s hard to explain confidence: Usually, confidence in the local market undulates with the oil price, but not always. The volume of sales in our local real estate industry rises and falls with the mood, sometimes, it seems, weekly. As a local real estate team fortunate enough to have an approximately 10% market share, we can feel these undulations. We discuss the market weekly in our agent meetings and it’s everyone’s favourite part! So. 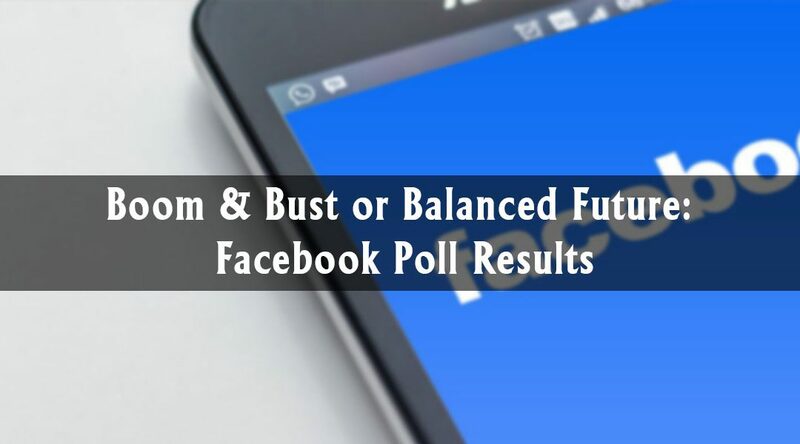 What About The Facebook Poll?? Wow! Confidence is back, and it feels great. I really really regret not polling this every quarter for the last few years. The only reason we posted this poll was in response to what we have been feeling since late November: people seem to have more confidence in buying in the local real estate market these days. Prices have fallen so much that it’s hard to imagine them falling that same dollar amount again (in many cases, that would be impossible). There are plenty of signs of recovery. But there is definitely a large minority of our followers who don’t expect another boom anytime soon. What have I learned? Well, for one thing, while hope is a beautiful part of human nature, it pays to have it at the right times. The market is dominated by the fundamentals, and as decision-makers for our families, we serve those families by being as right as possible as much of the time as possible. I’d be really interested to ask people what their preference would be as opposed to their expectation; would they want more booms or a more balanced future, like the Municipality’s slogan? I suspect the answer would depend on when they purchased their home… The idea of a balanced future is really appealing, given the roller-coaster we have been through, but that surely comes second to personal financial considerations. I’ll leave you with the news that, in the market area we study (see footnotes), Fort McMurray has seen 79 sales so far this month versus 55 in Jan 2017, 47 in Jan 2016 and 45 in Jan 2015. Did you miss the poll? If so, please feel free to leave your opinion in the comments below or on social media. We’d love to hear your thoughts. Whichever group of poll respondents later turns out to be correct, here’s to a happier, safer and healthier year for our beloved town than the sad years we’ve seen lately. We’ve been through the worst, and together, we’ll get through the rest. Cheers! Not intended to solicit clients currently under contract with a competing real estate brokerage. The interpretations of the MLS® data are my own and don’t reflect the opinions of the Fort McMurray Real Estate Board or its members. There is plenty of my opinion in here, but the data we are using is super accurate. The data covers sales of all property types only the following areas: Abasand, Beacon Hill, Dickinsfield, Downtown, Eagle Ridge, Grayling Terrace, Henning Ridge, Parsons North, Prairie Creek, Stone Creek, Thickwood, Timberlea, Waterways and Wood Buffalo.